In 3681 BBY the Sith Empire launches a surprise attack that starts the Great War. 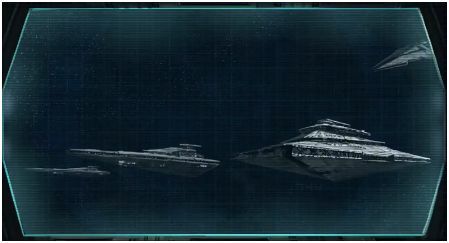 Centuries after being driven into exile, the Sith Empire returned from deep space to launch the most calculated military assault in Republic history. Strategically revealing its attack in a menacing manner, the Sith struck fear into the hearts of the Republics defenders even while orchestrating surprise attacks at carefully targeted locations across the galaxy. When the Republic fleet rushed to respond, they discovered the Sith had established puppet governments on several planets in the Outer Rim. Surrounded by enemies and traitors, the Republic fleet was forced to scatter, allowing the Sith Empire to sweep through most of the Outer Rim without further challenge. The Empires initial victories put the Republic at a disadvantage for the duration of the Great War. The sixth in a series of video entries giving the back story for the new Star Wars MMORPG The Old Republic. Watch the video below. I find it interesting how the Sith and Jedi both use about 1/2 of the teachings in the art of war in their combat strategy but they use different halves enhancing both their strengths and weakness toward each other.